Information technology lives all around us-in how we communicate, how we do business, how we shop, and how we learn. Smart phones, iPods, PDAs, and wireless devices dominate our lives, and yet it's all too easy for us to take information technology for granted. 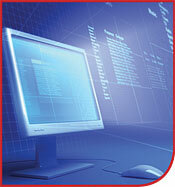 This course is an introduction to Information Technology and its applications to the business world. The student will explore issues with conducting business in a web based environment and how to achieve a competitive advantage a successful digital information system. Emphasis will be on information technology infrastructure with additional focus on wireless and mobile computing. Finally the student will explore the building and management of systems, from both the organizational and managerial perspective. The course is designed to provide students with a strong understanding of information systems and the enormous importance they hold in today’s business world. Identify the organization of information systems in general and their roles of the modern organization in a web-based environment. Describe how businesses generally use information systems. Assist in the management of both data and knowledge in managing an organization. Describe the infrastructure of the information technology system. Discuss the roles of e-businesses and e-commerce in today’s business environment. Determine the extent to which wireless and mobile computing must be taken into account when managing an organization’s delivery of information over the internet. Explain the method by which information systems can be acquired and applied. Manage information systems in a manner that takes into account ethical and social issues; especially those unique to the information age.